AK Beer Week events at HooDoo! 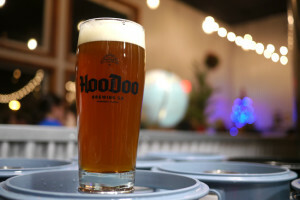 You are here: Home / Events / AK Beer Week events at HooDoo! Alaska Beer Week! 10 days of sudsy fun celebrating all things craft beer in Alaska. As always, we have a week packed full of events for the beer lover, and the beer curious. From showcasing local food vendors, to a statewide beer release, Fairbanks patrons will surely find something that week that appeals to them and their tastebuds. 5pm: KICK OFF! 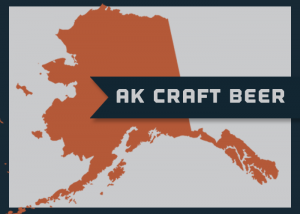 Raise your pints high and Join us in a statewide toast to Alaska Craft Beer! AK Beer Week photo competition launches on Facebook, Twitter and Instagram. Participants are encouraged to share how they are enjoying AK Beer Week by posting on social media and tagging #AKbeerweek and #HooDooBrew. Photos of the day will be chosen, and an overall #AKBeerWeek Photo Guru will be crowned on Sunday Jan 18. 12pm: New Release – The much anticipated HooDoo Barleywine 2015 will be tapped. Barleywine 2015 is our interpretation of a classic English Barleywine; the strongest of all the English Ales and a showcase of intense malt flavor and complexity. 11am until sold out – Lane’s Quickie Tacos in the Taproom with fine Fairbanks Tex-Mex favorites. 1:30pm – Brewmaster’s Class: Mind Your Malts. About the class: Barleywines are one of the biggest beers brewed, and also one of the most rewarding for the brewer. One of the major challenges for the style is the production of a high gravity wort, loaded with sugars the yeast can ferment into the warming alcohol Barleywines are known for. Learn why the base malt and the malts that are layered into the brew play a key roll to the success of making Barleywine, and many other styles. $25, includes a beer for class and a take-home pint glass. Limit 15 people. Reservation recommended by calling 459-BEER or by signing up in the taproom. 4pm – Brewery Tour. See how it’s made during a tour of our brewery. Brewmaster Bobby will lead a group of up to 15 people. Reservation recommended by calling 459-BEER or by signing up in the taproom. Free. 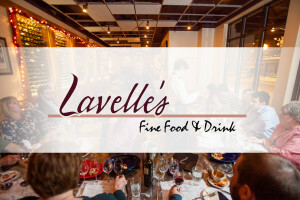 Enjoy a special 5-course beer dinner at downtown’s Lavelle’s Bistro. 3pm – Beer Release // HooDoo Barleywine Verticals – If you missed the lusciousness of our Barleywine, here’s your chance to be hugged by its velvety goodness. From the cellar, we will be tapping 2013, 2014, and their 2014 wheat whiskey barell-aged Barleywine. No growler fills of these rarities, but a Barleywine flights for individual vertical tastings will be available. Food by Brazen Bistro! They will have a delicious beer inspired menu: Midstate Meats brats braised in HooDoo beer and a house made IPA mustard w/fresh toppings, a HooDoo stout chili (with fresh fixings). One of Brazen’s favorites must also be included, Kölsch braised chicken bowl over local mashed potatoes and a herb cream sauce. Pay as you go. 3-6:30pm – Cheese + Beer sampling with Fred Meyer’s Murray’s cheesemongers. Sample expertly paired, high-quality cheese with local cheesemongers from Fred Meyer West. Cheese and fruit sample trays will be available for purchases, along with simple pairings and guidance you can use at your next gathering or dinner party. 6:00pm, The Banks Alehouse – A Fairbanks first: Tapping the AK Beer Collaboration Beer, a “I’ll Have Another” Rye Saison. The I’ll Have Another Rye Saison recipe was developed by a group of brewers during the Great Alaska Craft Beer and Homebrew Festival in Haines last Memorial Day weekend. The Brewers from HooDoo, Denali Brewing Co., Haines Brewing, Midnight Sun Brewing Co., and Kenai Brewing decided to collaborate on a recipe to be released during 2015 AK Beer Week. The Rye Saison was born from this session. All brewers use the same recipe and all brewed the beer on December 1. However, how they mash in and ferment the beer is up to them. The results will be varied and exciting! The Banks will have kegs from participating breweries and flights will be available, in addition to pints. In the Taproom, enjoy handmade chips and unique salsas made from local ingredients by Frostbite Farms, sample snack bowl for $5. 11am until sold out: Taproom Tacos – AK Beer Week Style – Hometown favorite Lane’s Quickie Tacos will be back in the taproom with a beer-infused twist on his delicious tex-mex faire. Come close out AK Beer Week with lunch at your local brewery! 11am-sold out: Local confectioner A&K Cupcakes will create an assortment of beer-inspired mini-cupcakes to pair with your Barleywine. That’s right, Cupcakes & Beer go hand-in-hand!